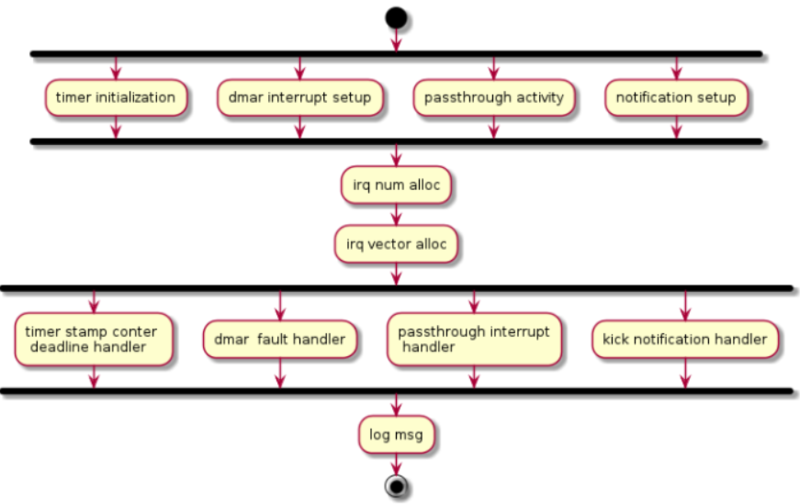 The ACRN hypervisor implements a simple but fully functional framework to manage interrupts and exceptions, as show in Figure 88. In its native layer, it configures the physical PIC, IOAPIC, and LAPIC to support different interrupt sources from local timer/IPI to external INTx/MSI. In its virtual guest layer, it emulates virtual PIC, virtual IOAPIC and virtual LAPIC, and provides full APIs allowing virtual interrupt injection from emulated or pass-thru devices. Configure interrupt-related hardware including IDT, PIC, LAPIC, and IOAPIC on startup. Provide APIs to manipulate the registers of LAPIC and IOAPIC. Set up a callback mechanism for the other components in the hypervisor to request for an interrupt vector and register a handler for that interrupt. HV owns all native physical interrupts and manages 256 vectors per CPU. All physical interrupts are first handled in VMX root-mode. The “external-interrupt exiting” bit in VM-Execution controls field is set to support this. The ACRN hypervisor also initializes all the interrupt related modules like IDT, PIC, IOAPIC, and LAPIC. HV does not own any host devices (except UART). All devices are by default assigned to SOS. Any interrupts received by Guest VM (SOS or UOS) device drivers are virtual interrupts injected by HV (via vLAPIC). HV manages a Host-to-Guest mapping. When a native IRQ/interrupt occurs, HV decides whether this IRQ/interrupt should be forwarded to a VM and which VM to forward to (if any). Refer to section 3.7.6 for virtual interrupt injection and section 3.9.6 for the management of interrupt remapping. HV does not own any exceptions. Guest VMCS are configured so no VM Exit happens, with some exceptions such as #INT3 and #MC. This is to simplify the design as HV does not support any exception handling itself. HV supports only static memory mapping, so there should be no #PF or #GP. If HV receives an exception indicating an error, an assert function is then executed with an error message print out, and the system then halts. On an exception, the hypervisor dumps its context and halts the current physical processor (because physical exceptions are not expected). For external interrupts, HV may mask the interrupt (depending on the trigger mode), followed by interrupt acknowledgement and dispatch to the registered handler, if any. Most interrupts and exceptions are handled without a stack switch, except for machine-check, double fault, and stack fault exceptions which have their own stack set in TSS. ACRN hypervisor masks all interrupts from the PIC. All legacy interrupts from PIC (<16) will be linked to IOAPIC, as shown in the connections in Figure 91. ACRN will pre-allocate vectors and mask them for these legacy interrupt in IOAPIC RTE. For others (>= 16), ACRN will mask them with vector 0 in RTE, and the vector will be dynamically allocate on demand. All external IOAPIC pins are categorized as GSI interrupt according to ACPI definition. HV supports multiple IOAPIC components. IRQ PIN to GSI mappings are maintained internally to determine GSI source IOAPIC. Native PIC is not used in the system. Physical LAPICs are in xAPIC mode in ACRN hypervisor. 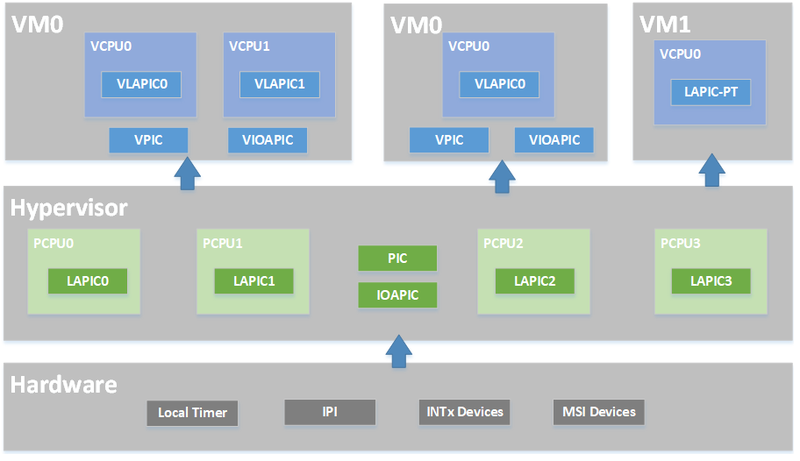 The hypervisor initializes LAPIC for each physical CPU by masking all interrupts in the local vector table (LVT), clearing all ISRs, and enabling LAPIC. 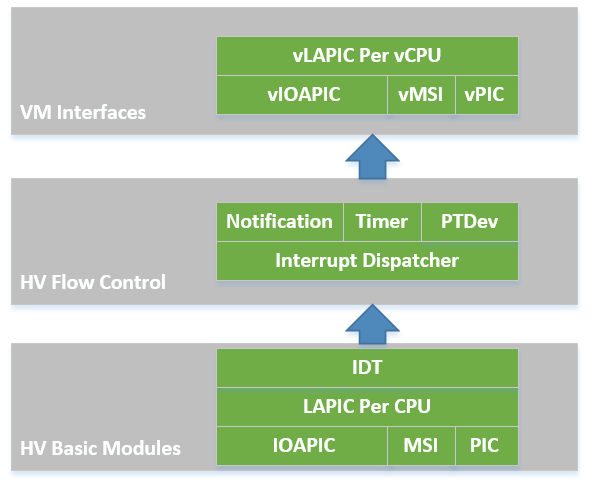 APIs are provided to access LAPIC for the other components in the hypervisor, aiming for further usage of local timer (TSC Deadline) program, IPI notification program, etc. See Data structures and interfaces for a complete list. are exceptions that are not handled by HV. If such an exception does occur, the system then halts. are allocated statically for legacy IRQ0-15. are dynamically allocated vectors for PCI devices INTx or MSI/MIS-X usage. According to different interrupt delivery mode (FLAT or PER_CPU mode), an interrupt will be assigned to a vector for all the CPUs or a particular CPU. are high priority vectors reserved by HV for dedicated purposes. For example, 0xEF is used for timer, 0xF0 is used for IPI. 0x0-0x13 Exceptions: NMI, INT3, page dault, GP, debug. Interrupts from either IOAPIC or MSI can be delivered to a target CPU. By default they are configured as Lowest Priority (FLAT mode), i.e. they are delivered to a CPU core that is currently idle or executing lowest priority ISR. There is no guarantee a device’s interrupt will be delivered to a specific Guest’s CPU. Timer interrupts are an exception - these are always delivered to the CPU which programs the LAPIC timer. There are two interrupt delivery modes: FLAT mode and PER_CPU mode. ACRN uses FLAT MODE where the interrupt/irq to vector mapping is the same on all CPUs. Every CPU receives same interrupts. IOAPIC and LAPIC MSI delivery mode are configured to Lowest Priority. ACRN hypervisor maintains a global IRQ Descriptor Table shared among the physical CPUs. ACRN use FLAT MODE to manage the interrupts so the same vector will link to same the IRQ number for all CPUs. The irq_desc array’s index represents IRQ number. An irq_handler field could be set to common edge/level/quick handler which will be called from interrupt_dispatch. The irq_desc structure also contains the dev_list field to maintain this IRQ’s action handler list. 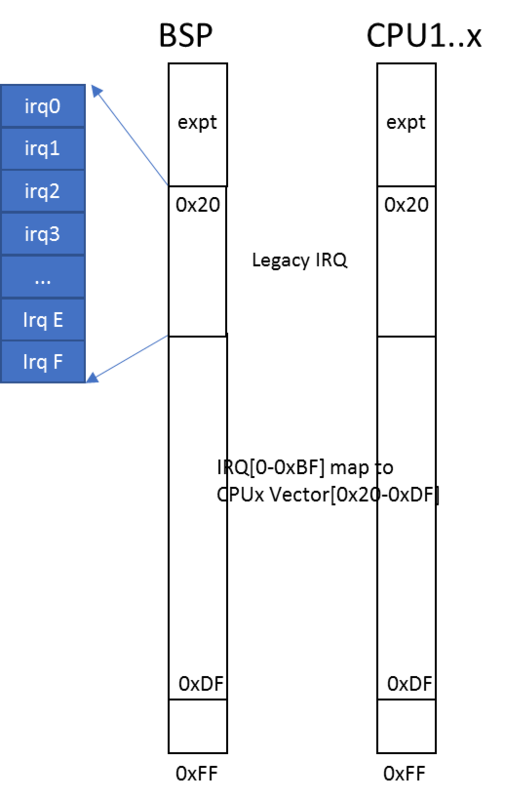 Another reverse mapping from vector to IRQ is used in addition to the IRQ descriptor table which maintains the mapping from IRQ to vector. On initialization, the descriptor of the legacy IRQs are initialized with proper vectors and the corresponding reverse mapping is set up. The descriptor of other IRQs are filled with an invalid vector which will be updated on IRQ allocation. CPU runs under VMX non-root mode and inside Guest VMs. MSR_IA32_VMX_PINBASED_CTLS.bit and MSR_IA32_VMX_EXIT_CTLS.bit are set to allow vCPU VM Exit to HV whenever there are interrupts to that physical CPU under non-root mode. HV ACKs the interrupts in VMX non-root and saves the interrupt vector to the relevant VM Exit field for HV IRQ processing. Note that as discussed above, an external interrupt causing vCPU VM Exit to HV does not mean that the interrupt belongs to that Guest VM. When CPU executes VM Exit into root-mode, interrupt handling will be enabled and the interrupt will be delivered and processed as quickly as possible inside HV. HV may emulate a virtual interrupt and inject to Guest if necessary. When an physical interrupt happened on a CPU, this CPU could be running under VMX root mode or non-root mode. If the CPU is running under VMX root mode, the interrupt is triggered from standard native IRQ flow - interrupt gate to IRQ handler. If the CPU is running under VMX non-root mode, an external interrupt will trigger a VM exit for reason “external-interrupt”. 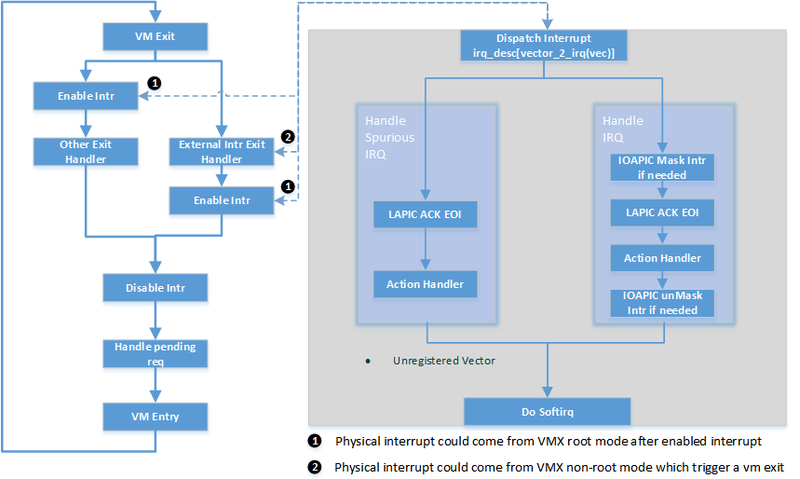 When a physical interrupt is raised and delivered to a physical CPU, the CPU may be running under either VMX root mode or non-root mode. If the CPU is running under VMX root mode, the interrupt is handled following the standard native IRQ flow: interrupt gate to dispatch_interrupt(), IRQ handler, and finally the registered callback. If the CPU is running under VMX non-root mode, an external interrupt calls a VM exit for reason “external-interrupt”, and then the VM exit processing flow will call dispatch_interrupt() to dispatch and handle the interrupt. 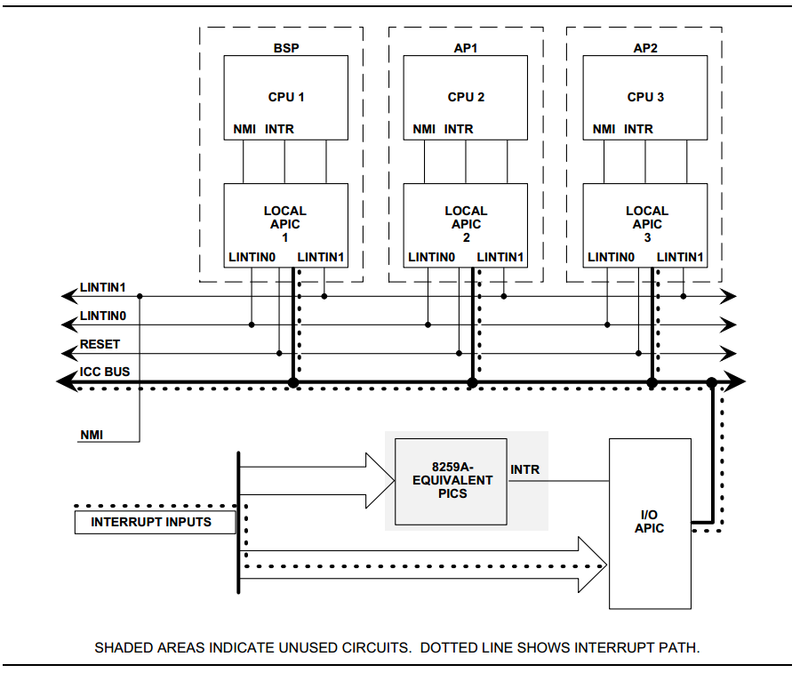 After an interrupt occurs from either path shown in Figure 93, ACRN hypervisor will jump to dispatch_interrupt. This function gets the vector of the generated interrupt from the context, gets IRQ number from vector_to_irq, and then gets the corresponding irq_desc. For pass-thru devices, to avoid continuous interrupt triggers, it masks the IOAPIC pin and leaves it unmasked until corresponding vIOAPIC pin gets an explicit EOI ACK from guest. The IRQ number inside HV is a software concept to identify GSI and Vectors. Each GSI will be mapped to one IRQ. The GSI number is usually the same as the IRQ number. IRQ numbers greater than max GSI (nr_gsi) number are dynamically assigned. For example, HV allocates an interrupt vector to a PCI device, an IRQ number is then assigned to that vector. When the vector later reaches a CPU, the corresponding IRQ routine is located and executed. The only purpose of IPI use in HV is to kick a vCPU out of non-root mode and enter to HV mode. This requires I/O request and virtual interrupt injection be distributed to different IPI vectors. The I/O request uses IPI vector 0xF4 upcall (refer to Chapter 5.4). The virtual interrupt injection uses IPI vector 0xF0. A Guest vCPU VM Exit exits due to EPT violation or IO instruction trap. It requires Device Module to emulate the MMIO/PortIO instruction. However it could be that the Service OS (SOS) vCPU0 is still in non-root mode. So an IPI (0xF4 upcall vector) should be sent to the physical CPU0 (with non-root mode as vCPU0 inside SOS) to force vCPU0 to VM Exit due to the external interrupt. The virtual upcall vector is then injected to SOS, and the vCPU0 inside SOS then will pick up the IO request and do emulation for other Guest. If Device Module inside SOS needs to inject an interrupt to other Guest such as vCPU1, it will issue an IPI first to kick CPU1 (assuming CPU1 is running on vCPU1) to root-hv_interrupt-data-apmode. CPU1 will inject the interrupt before VM Enter. The following APIs are external interfaces for IOAPIC related operations. *   RTE, vector, trigger mode etc. For debugging only. The following APIs are external interfaces for LAPIC related operations. The following APIs are external interfaces for IPI related operations. The following APIs are external interfaces for physical interrupt related operations. *  irq count on each physical cpu.